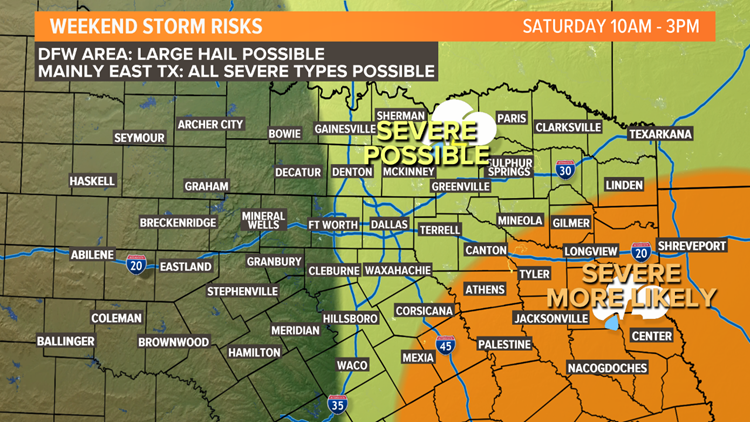 Thunderstorms are likely in North Texas, yet again, and some storms could be strong to severe. 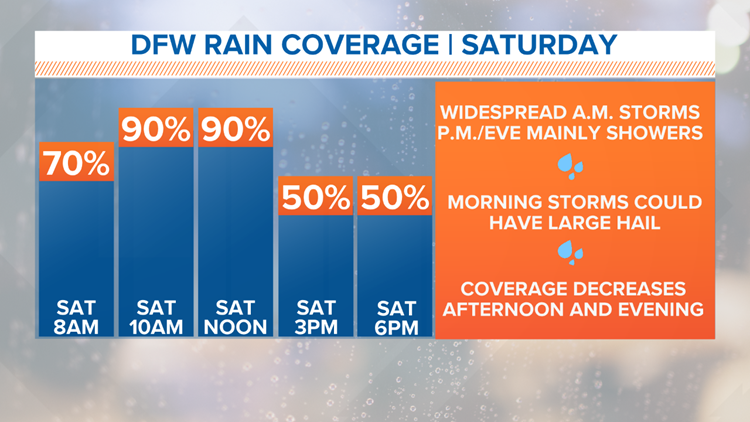 However, the entire weekend will not be a washout. Here we go again. Thunderstorms are likely this weekend, but the entire weekend will not be a washout. Showers and storms will be most widespread during the morning into midday and early afternoon hours on Saturday. Showers and storms will decrease in coverage through the afternoon into evening, but lingering showers will be out there into the evening. Showers and storms will continue being most widespread through around the midday hours. For the DFW area, thunderstorms will be ongoing into early afternoon. Overall severe risk is low, but some storms could have large hail. The higher severe threat during this time-frame will be in southeastern North Texas (Canton to Athens to Corsicana) and East Texas. This is where all types of severe weather will be possible (hail, damaging winds, and tornadoes). Those of you that live in these areas need to pay attention to the weather throughout this time because of the better chance for severe storms. Widespread t-storms and severe weather risk will continue to shift east into Arkansas, Louisiana, and far East Texas. Most of North Texas will be severe weather-free by this time. There may be a lull in shower and storm activity during the mid-afternoon hours, but lingering rain is possible heading into the evening. Lingering showers will continue late afternoon into the evening. Some rumbles of thunder are possible, but the severe weather threat is very low. During the evening into nighttime hours, any lingering showers will continue to slowly shift east. Most of North Texas will be rain-free by the early morning hours Sunday. In the wake of Saturday's system, Sunday will be breezy and cool. Skies will clear and winds will be breezy out of the north. Lows on Sunday will be in the 40s and highs will be in the 60s. Rain-free, but a cool end to the weekend. A Wind Advisory has been issued from 4 p.m. Saturday to 7 a.m. Sunday for most of North Texas counties.